BETA is bustling tonight, and there is plenty of Faroese being spoken among the patrons attending, all eager to watch two of the most prominent artists from the North Sea archipelago. Hamferð and Svartmálm are in fact paired up here in Copenhagen for the second time this year already, but with 2018 albums to promote, and with touring opportunities without a doubt hard to come by in the sparsely populated Faroe Islands, no one seems to mind their quick return — certainly not yours truly, having missed the aforementioned concert at VEGA in February due to skiing in the French Alps. It is thus with an ounce of excitement that I edge my way to the front row to take in the evening’s first act. Svartmálm have come a long way since I was introduced to them at the 2017 edition of the New S**t Showcase. 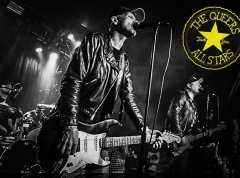 The band has swollen into a quartet, unleashed a début album (reviewed here) and — by the looks of it — amassed lots of experience to become a more confident live act. As always, the four musicians obscure their faces with tattered hoods, giving the band a mysterious pagan appearance that works well with the esoteric style of the music. Svartmálm’s music is part black, part doom and part post-metal and arranged in such a way as to leave no breaks in between the songs; the transitions are filled with ambient sounds in order to ensure that the eerie atmosphere conjured by the opening track never withdraws, and that the set pans out almost like a single song. This flow was missing from the aforementioned concert in 2017 and it makes a big difference tonight in terms of opening up, and drawing me into the soundscape. Because the pace remains a shade of glacial throughout, this kind of total immersion in the cold and dark and droning grandeur of Svartmálm’s universe is vital in terms of coming to appreciate it — that way, the songs transform into something evocative, and make the sudden eruptions of noisier, more dissonant, and at times even borderline psychedelic instrumentation feel so much more powerful. Although the four musicians — known only by their pseudonyms Deyði (guitar & vocals), Pest (guitar & keyboard), Hungur (bass) and Kríggj (drums) — tend to conform to the nature of the music, moving little and offering no interaction whatsoever with the audience, there is an explosive alter ego hiding within their introspective selves, battling its way to the surface and sending Hungur in particular into a frenzy during these more energetic moments. But while such bursts of energy do add something to Svartmálm’s overall expression, there is enough of a visual aesthetic in place regardless so as to render them simply a garnish. Indeed, it is ultimately the sustained atmosphere — this feeling of being unable to escape the throes of Svartmálm’s music before they choose to bring it to a conclusion some 40 minutes later — that earns my approval, not the extent to which the band members physically exert themselves. It isn’t that kind of music; this Faroese group instead deals in the subtleties, resulting in a mesmerising show. I’ve been told that the one of the main ideas behind Hamferð’s music is to create a funereal and mourning atmosphere, and that is exactly the style they implement on the opening track, “Vráin” (off their 2013 EP, “Vilst er síðsta fet”). 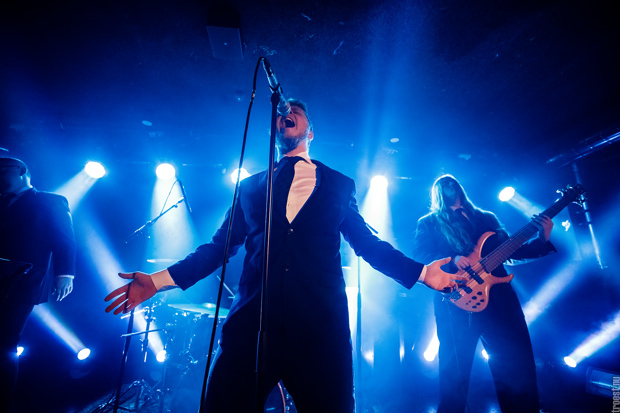 The six musicians appear on stage dressed in black suits and black ties, and there is something almost priestlike about vocalist Jón Aldará’s profound expression, as he stands completely still with his hands crossed in front of him when the song turns instrumental. When it is his turn to take the lead, however, Aldará reveals a truly impressive vocal range, mastering guttural growls, icy shrieks, powerful roars and the sort of dramatic tenor singing you might expect to hear at an opera. And on top of that, every pained word that leaves his lips seems to be accompanied by a visible emotion, the lyrics emphasised by his hands and the anguish flashing across his face. 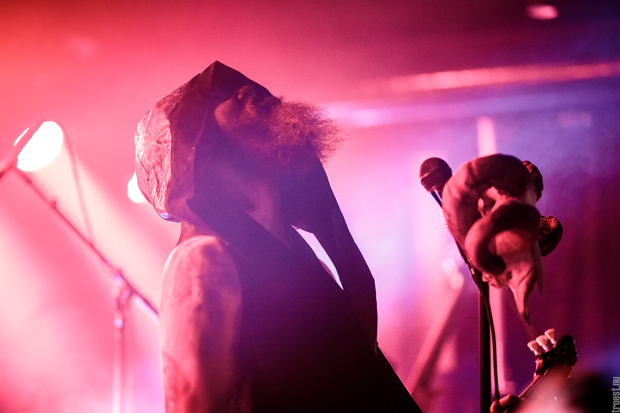 It is a clever way to introduce movement to a performance which is otherwise quite static, as befits the epic death/doom metal genre to which Hamferð subscribes. 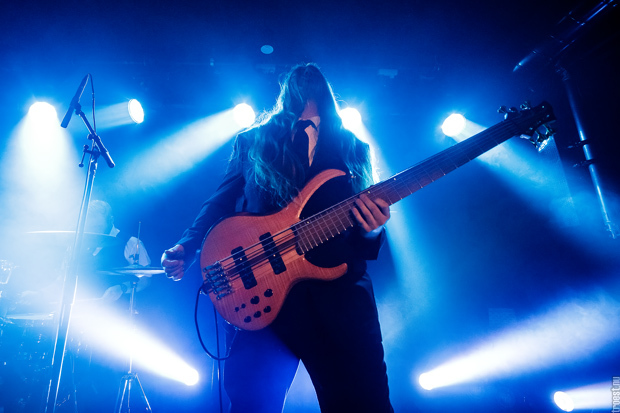 In fact, the five musicians surrounding Aldará are standing ghastly still even when the likes of “Deyðir varðar” (taken from the band’s 2013 album, “Evst”) take the music onto another level of grandiose, with cymbals crashing, melancholy guitar notes wailing and the bass and rhythm guitars churning gut-wrenchingly. It is no wonder that Hamferð has been compared to some of the heavyweights of elegiac doom, such as Draconian, My Dying Bride and Swallow the Sun. And although the Faroese sextet only have two full-length albums to their name, a full decade of experience has made a clear impact on their synergy as a band, each musician fully embracing his role in creating the distinct mood Hamferð are hoping to establish as their signature. Contributing to this mood also is the limited interaction Aldará and his colleagues have with the audience; it serves them better to transition between songs like the quietly beautiful “Frosthvarv” and the faster, though no less crushing “Hon syndrast” (both of which appear on Hamferð’s latest album, this year’s “Támsins likam”) without a traditional pause, and to maintain the same sort of respectful silence as one would at an actual funeral. 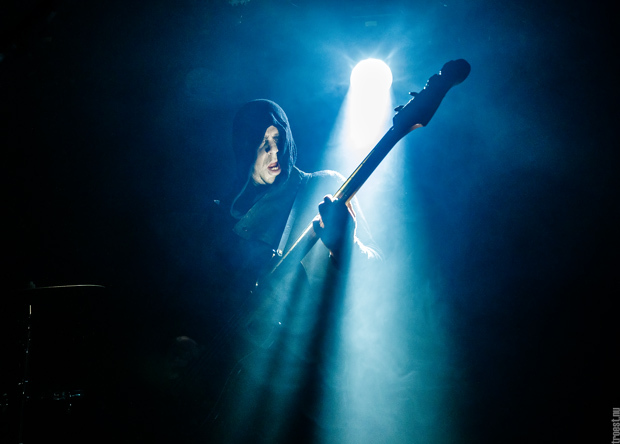 There is nothing silent about Hamferð’s music of course — in fact, it is some of the grandest and loudest doom metal available, as evidenced by the likes of “Evst” near the end of the set. No, the show takes mourning to epic proportions and appropriately, when it is time for an encore, the procession concludes with Hamferð’s take on an old Faroese funeral hymn (“Harra guð, títt dýra”), preceded by the “Our Father” prayer in their native tongue. It is a beautiful finale to a spellbinding concert, one which cements Hamferð as one of the premier practitioners of epic doom metal right now.